O what a fun weekend we have in store for us. We’ve already spent the better part of this week covering the many General Conference-related rumors as well as offering up our temple announcement predictions. But all of those deal with supposition, prediction, and flat-out guesswork (also, some light mockery). 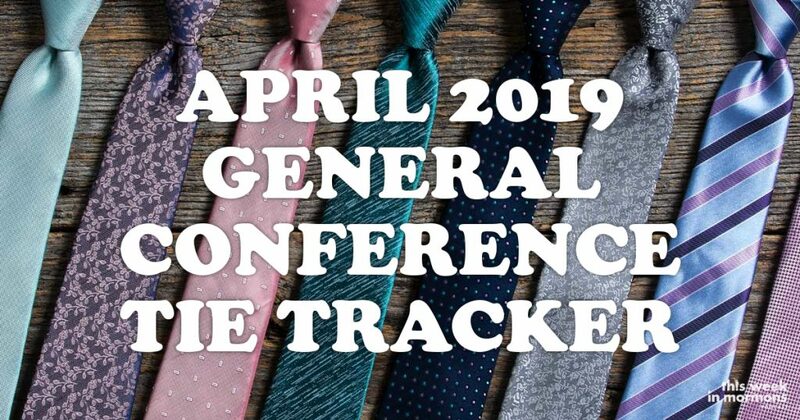 Now we get to dive deeply into the Hard Facts™ real of our semiannual General Conference Tie Tracker™! 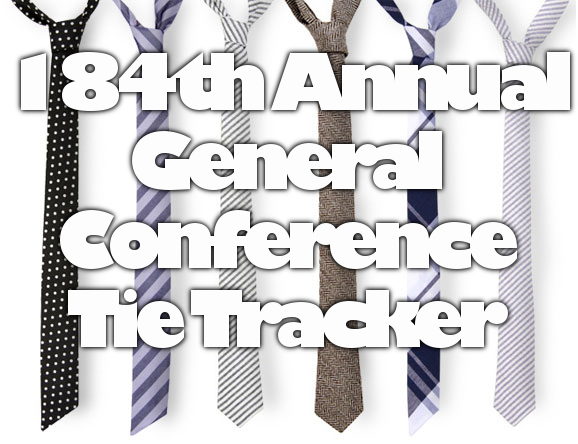 If you are new here — first of all, shame on you by 1,000 times — we use the Tie Tracker to keep track of sartorial trends during General Conference. The men who speak wear an assortment of ties, none of them skinny, covering the gamut of patterns and colors. Typically, old standbys red and blue dominate the proceedings, but sometimes a rogue will surprise us, like last time around with purple. 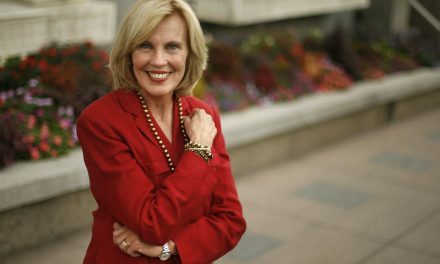 As for the women, they pretty reliably follow the strange Latter-day Saint fashion choice of dresses with blazers, but female leadership has become a bit more stylish of late. We’ll track the dresses, blazers, inevitable neckwear, and more. There’s no women’s session this time around, so don’t expect a huge sample on this end. This conference will be alllll about the XY! Is there a reason for this? Not exactly. It’s mostly a way to have a bit of fun during General Conference and also try to quietly judge the speakers based on their fashion choices. (It should surprise none of you that a certain German tends to be the most stylish.) But in all seriousness, doing this regularly even once tipped us off about some speaker’s habits, such as the late Elder Robert D. Hales always wearing the same tie each General Conference. Eventually, Elder Neil L. Andersen told the story about why Elder Hales did this. We like to think our stalwart reporting drove us to this point. You can reference the charts below to see real-time updates. We’ll provide analysis following every session. Red did it! It was close before the session, and then everyone suited up with their power ties to show who was boss. Red was everywhere, capturing 31% of the share in the final tally. Purple’s share declined and blue tried to hang in there, but it was for not. Patterns continued their fusillade against everyone else, as expected, taking over 47% share. Patterns are surprisingly destroying other styles at this point. Normally it’s a bit of a slugfest between patterns and stripes, but right now, the former leads the latter by 20 points. It’ll be hard at this point for stripes to make up much ground with only one session left, so we’ll call it right now: patterns will win. Elder Renlund was nice to bless us with a tie that we say had pure white stripes, although one Twitter follower dubbed it “celestial silver,” so we might have to change the category name to that! Perhaps most unfortunate – green has not made much of a showing this time out, and we spotted Elder Uchtdorf wearing his sharp green tie while sitting on the rostrum. We need him back at the pulpit! Props to Sister Sharon Eubank, who is always a joy, for wearing pink on pink. We had to give her a new category to cover it! How will things end? Will blue remain dominant or will red surge in the end to overtake it? Purple has hung in there, but can it make a stronger finish than third place? All love goes to Elder Cook of the Seventy for bringing plaid back into our lives. We haven’t had a legit plaid tie in years. He is everything to us. President Oaks was probably a bit too casual about a squirrel dying. Everyone laughed! It was a squirrel! It’s not the smartest animal on earth, but it’s not the dumbest (which is, as we all know, the turkey). Anyway, the points were good, but come on! President Nelson wants us to repent every day and do a little better each day. Good counsel! Be the best version of yourself! Elder Gary E. Stevenson went all in on sports analogies to preach preparedness. 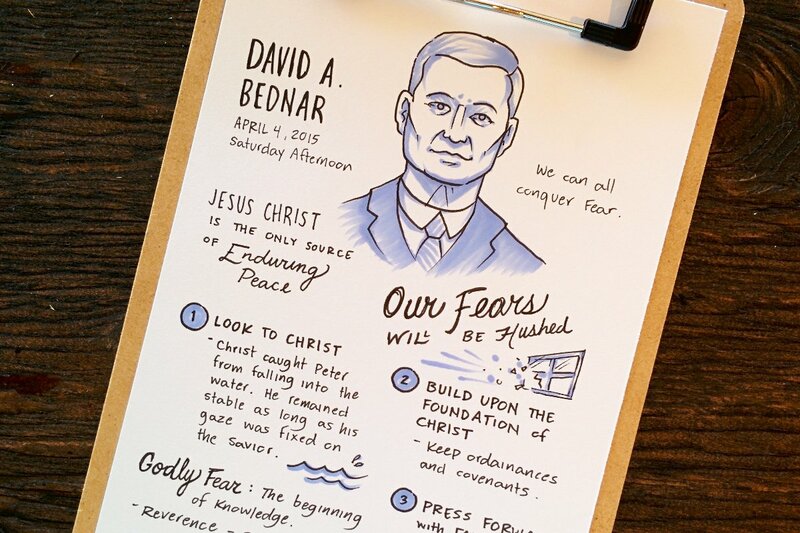 Indeed, preparedness and looking to the future was a common thread throughout the priesthood session. OK, so none of the other ties were anything that special. 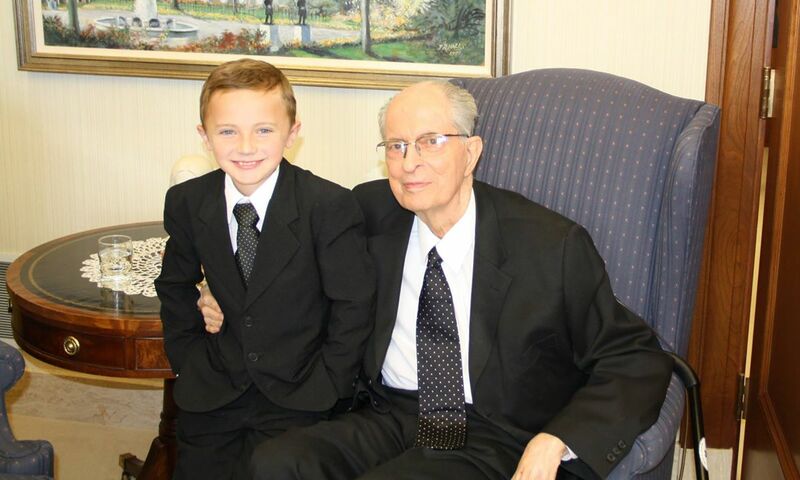 But we will say this: there was much debate about Elder Clark’s tie. Was it purple? Was it blue? This was “The Dress” all over again. In the end, we gave it to blue. Had it gone purple’s way, that wonderful combination of red and blue actually would have taken the lead among all colors. Unheard of! Purple has been strong. Where did this come from? It’s barely behind blue. Now in saying “Purple,” we’re sort of including the handful of burgundy ties worn. Burgundy is more purple than red, right? Or maybe we just don’t want red to have too much of a lead. We didn’t really have a standout tie in terms of color or pattern, and there were no female speakers. But the shoutout goes to Elder Mathias Held wore some sort of beautiful violet tie with undecipherable emblems on it. We’re not sure what was there, but we’re hoping it was random stuff, like images of a barbeque and dogs playing poker. Well! That was a surprisingly “standard” session of General Conference in light of how much we expect world-altering mayhem nowadays. 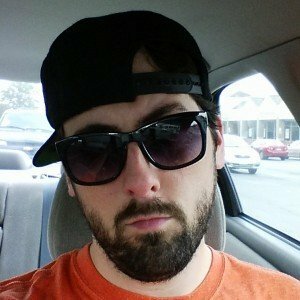 Great stuff all around. Big points to talks by Sister Craven, Elder Uchtdorf, and Elder Hales. Now onto fashion. Sister Craven was kind enough to wear a classy dress and didn’t even bother with a blazer. Good on her! Now we’ll say less about female fashion for fear of accidentally mansplaining. Stripes and patterns ruled the session, as you can see above. Party times all around. So we’ll just get it out of the way and give all the love to Elder Uchtdorf. That tie – that glorious, gold, almost orb-laden tie – might be the best we see all General Conference. Elder Uchtdorf has typically been more fashion forward than others (and during his time in the First Presidency, was the only top leader to change his ties for every session, even on the same day). Since we won’t see him at the pulpit for the rest of Conference, we’ll have to keep an eye on him during some of the wide shots to see if he still mixes it up. But with that said, only non-prayer time at the podium counts toward our tally, so it will merely be anecdotal.